Motel Bavaria - Radium Hot Springs, B.C. Radium Hot Springs Motel Bavaria. Traditional Accommodations in the Columbia Valley. Motel Bavaria is a two story alpine theme motel just one block off the main highway, on a quiet street, offering 26 non-smoking units including 13 efficiency suites. They invite you to relax on their sundeck or on loungers in the sun or under our trees for shade, with the backdrop of the beautiful Rocky Mountains. Cook your meals on the Motel Bavaira Barbecues and enjoy the gazebo. 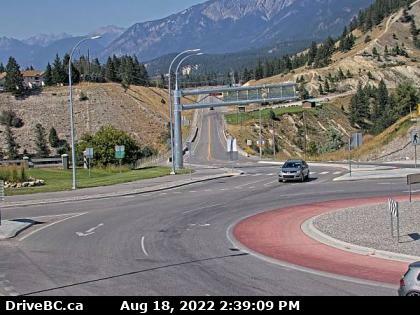 Take a day of golfing at one of the many golf courses in the area and take a leisurely walk to the park, do a little shopping, mini golfing or dine in one of the many restaurants within the Village of Radium Hot Springs. Enjoy a scenic 4 km hike or drive to soak in the Radium Hot Springs and then have a restful night in our clean, comfortable, quiet rooms. Motel Bavaria rooms include; a clean, quite and tastefully decorated with bar size fridges, microwaves and coffee makers with complementary coffee. 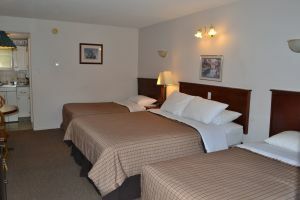 Rooms include 27″ flat screen TV’s with cable, queen size beds and combination baths.